Long ago Daniel Roxburgh,a man in his early 30s, made a desperate decision which ultimately costed his relation with his wife.Now after many years he is being tormented by several unusual sightings which are far aloof from being understood by a human mind but this is not the only thing bothering him, several adversities are also spelling doom in his life which used to be peaceful and happy once.Things began to unravel themselves when he meets a veteran psychic , Keshav,but as he voyages into the darkness he realizes that the mysteries unsolved were far better than the harsh truth which begins to come to the forefront. Kumar Rajgeet was born on the 4th of December 1988 in Lucknow city,India. reflected all through this work of his. From: This sender is DomainKeys verified"Kumari Ojasvita"
This work of fiction is a perfect blend of fantasy and mysticism. 'Bedevilled' is a by-product of subtle contemplation, in which the effects of emotions on human conscience has been wonderfully portrayed. The story flows, reaches a thrilling height and then takes a queer turn, unveiling the mystery. The writer's profound insight into the human heart, the simplicity of his style and his sense of justice, with which he has revealed the springs of human motives and actions, is unparalleled. 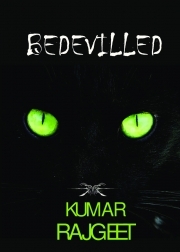 My heartiest felicitations to the rising prodigy..
Bedevilled is an awsome novel. Great story. Its great how things unfold in this novel. Its mystifying. Couldn't keep the book away until I finished it.